These are the last two quilts from the International Quilt Festival last weekend. Undoubtedly, they both represent superior craftsmanship but what appealed to me most was the theme. If you read My First Post, you will understand why I love these quilts showing a woman’s hands at work. Women find themselves continually mending the fabric of their lives, trying to restore beauty and function in the aftermath of war, greed and lust. 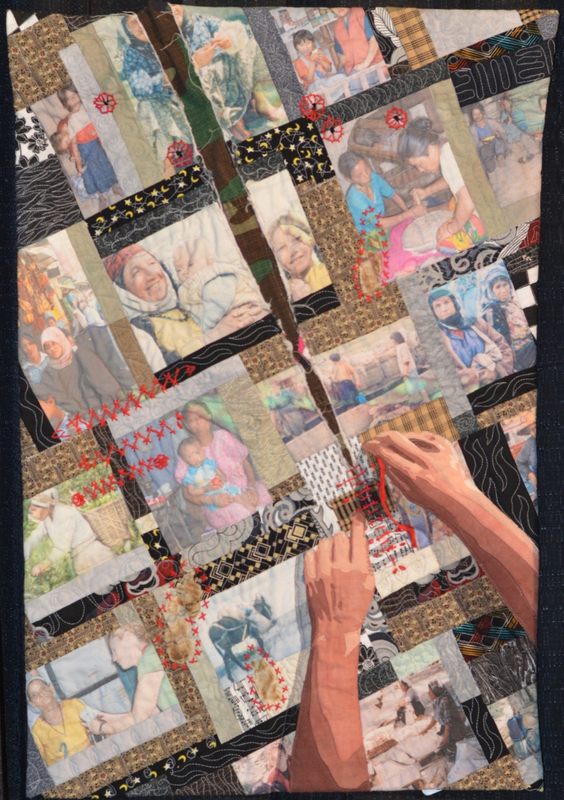 This quilt began as a collage of photos collected over a decade of living, working and traveling overseas. The quilt top was then torn, cut, burned and shot – literally, tearing families apart. Finally, the woman’s hands are shown working to stop the destruction, mend the damage, and repair the vision. Upon seeing this quilt, I couldn’t help but think about atrocities committed against women. Just the other day, there was an article on CNN about how women and girls in Haiti continue to be raped in the makeshift tent cities that serve as their not so temporary homes. A BBC report recounts details of sexual violence against prisoners in Syria. There are many more stories every day. I did not mean to lead you down an unhappy path. But my heart goes out to these women and I am ever more grateful for so many blessings in my own life. Viva Quilt by Noriko Nozawa, Japan. It is heartwarming to see so many hands at work. Each person contributes busily cutting, sewing and ironing and each leaves his or her mark on the quilt. 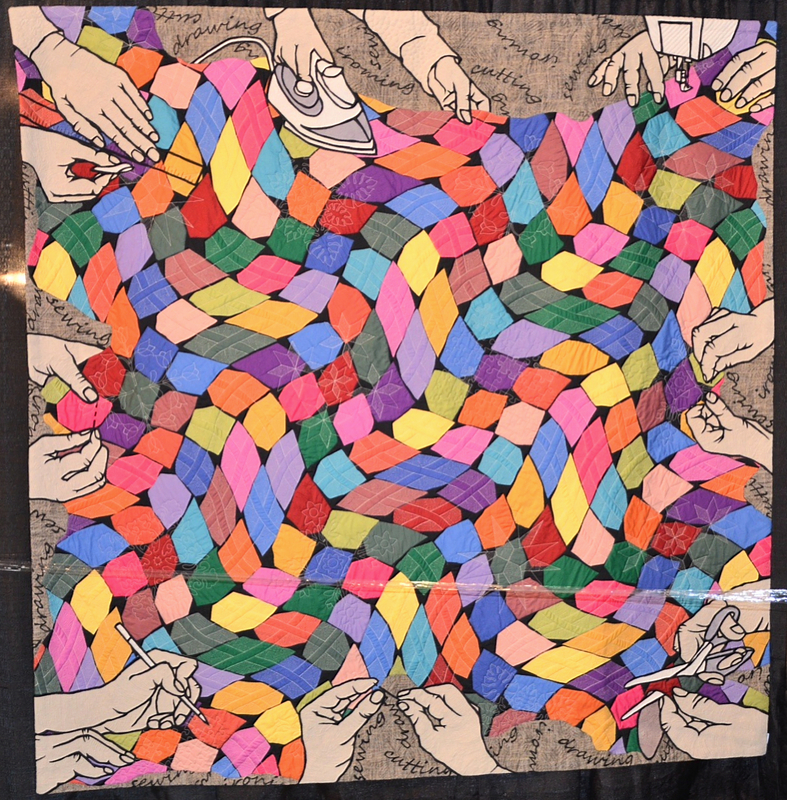 This quilt fills me with joy and leaves me feeling hopeful about what people can do when they come together, each contributing their own unique gifts. This has been a really lovely series of posts, thanks for this. They struck a chord with me. Yes and these especially had so much meaning. Thank you for sharing these lovely pieces. Of course. It was my pleasure. Oh wow, they are both fantastic. I love it when there is such heartfelt meaning behind a quilt. I was surprised to read how they shot and tore that first quilt to give it that worn in look but it adds so much to the theme. The other one’s bright colors give a whole different feel – more vibrant and happy. Both quilters really put a lot of thought into these. These quilts are beautiful! I found you through Optic Nervy. Glad you found your way here to enjoy them. OMGoodness. How beautiful in concept and execution! Very, very moving. They really are works of art. I wish I had time to give quilting a go but my yarn stash beckons. Love these quilts! Nice article Veronica! Thanks for liking my post too! I’ll be back for sure! I thought the knit newborn hat with matching leg warmers were so cute!! I love this piece. Your voice in speaking of the quilts and the women who create them is lovely and caring. The theme of the quilts really meant alot to me. Thanks so much for stopping by. These works are really powerful. I really like your blog, looking forward to seeing more! Thank you so much for visiting mine. Aren’t they! I would love to make something that impactful. I really liked the silver dress you made. Nice! Thank you for liking one of my posts; I really enjoyed looking at the pictures your husband took in Bankok. The spinning of the silk is so interesting! These quilts, however, really caught my eye. I love the opinions you have posted with them and the value of a community. Thank you for your time on my blog; I will follow yours! 🙂 And I hope you have fun on your trip, if you’re still out (I forgot to check the date lol). Your crochet hat caught my attention. I had just met a Chinese lady crocheting and bought a hat from her!